Plants represent the most positive attributes of the growing wood element – the only element amongst the five elements that has life. Plants possess intrinsic yang energies that enhance all the space around them. Plants also manifest the balance of yin and yang in the garden, responding to the mix of sunlight and shade, water, and nutrients from the soil. To create a space with good feng shui, the use of plants is absolutely necessary. If you want good garden feng shui, you must spend time creating the right mix of plants, and this mix should take note of orientations, shapes and colours. There are also auspicious and inauspicious plants and depending on where you live in the world, it is a good idea to examine the qualities that make a plant auspicious and the characteristics that make a plant inauspicious. 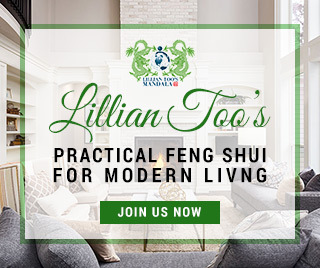 A garden planted with an abundance of healthy plants and flowers is the best indication that a house is enjoying good feng shui: it reflects the presence of healthy yang energy, which is synonymous with prosperous, happy and vibrant Chi. Gardens are as important as the actual house, because if they are unkempt and overgrown, they can destroy the existing good feng shui of the home. Select plants and flowers wisely according to soil type, sunlight and the climatic conditions of the garden. Never allow plants to grow wild or unchecked. Do not allow weeds to choke flowerbeds and always clear up leaves and other garden debris. The plum, whose blossom are regarded as pure and superior. The bamboo, which is disciplined and upright. The orchid, which is reclusive and strong in character. The chrysanthemum, which is pureand honest. In feng shui, certain plants are more auspicious than others. Succulent plants with round full leaves and rich dark leaves are deemed to be the most auspicious and therefore the best. They symbolize money and gold. This plant attracts money and prosperity. Place near the front door in a large pot. Do not allow it to grow larger than 3 feet (1m) and because it is a succulent cactus, try to avoid over watering. A succulent, leafy good-fortune plant with fan-shaped leaves and silvery sheen. Do not over water. 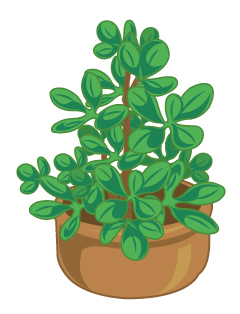 This plant brings wealth and money luck. 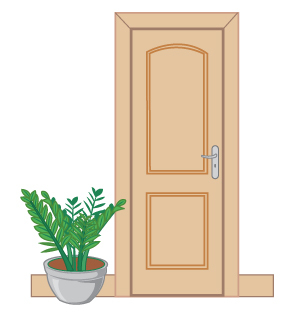 Place near the main door of your home. The rich, yellow, round-headed chrysanthemum is particularly highly regarded by the Chinese and the Japanese. Yellow is the most auspicious colour in a flower, associated with a life of ease. Chrysanthemums may be used to equally good effect in the garden or in a window box during the summer. This is regarded by the Chinese as the king of flowers, a flower of riches and honour, a Yang flower, and the essence of spring. The peony represents feminine beauty and of the many colours in which it comes, red is regarded as being especially lucky for families with daughters who are looking for a partner. If you buy a peony, plant it in the Southwest corner of your garden to attract relationship, marriage, or romance luck in the home. Other plants that resemble the peony may be used as substitutes although their flowers may not last as long. These include the hibiscus, gardenia and begonia. Begonias are quite easy to cultivate and are excellent for adding colour to the garden. A symbol of good fortune and longevity, the flowers of the plum blossom signify purity, and the tree is noted for its delightful fragrance. Planted in the North of the garden, the plum tree will be most auspicious, although it can also be placed in any part of the garden at the back of the property. The white magnolia is a symbol of purity and a single magnolia tree planted in the front garden is said to attract great contentment. Grown in the back garden, it is said to symbolize hidden jewels, or the gradual accumulation of great wealth. The Chinese believe that the narcissus symbolizes great good fortune and these flowers are usually given as auspicious gifts in the New Year. They are relatively easy to grow, but do not choose the dwarf variety which is not auspicious. This is regarded as the aristocrat of bulbs. 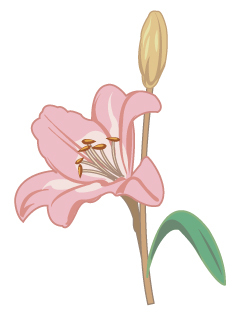 With a wonderful scent and glorious appearance, in full bloom the lily represents good feng shui throughout the year. If you have a water feature, this is the most auspicious plant to have. It is believed to inspire peace and contentment, and to symbolize the opening of opportunities. The lotus blossom is also associated with the Buddha and growing a lotus will engender a growth of spiritual consciousness. The bamboo is widely represented in Chinese art, literature and poetry and is believed to have the power to ward off malign spirits if displayed in the home in the form of, for example, wind chimes or flutes. 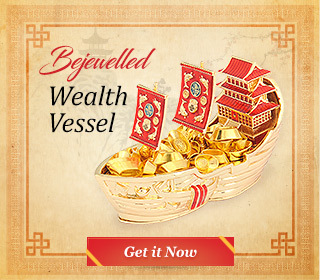 It also symbolizes durability and endurance (because it flourishes throughout the year) and a bamboo clump on the left side of your home to signify the dragon is highly auspicious. Planted near the front of the home, it attracts auspicious Chi flows. The pine tree is often planted with the cypress tree because both can survive the harshest of winters; together they symbolize eternal, constant friendship. The pine is also associated with fidelity. Note: Good feng shui involves maintaining the garden: trimming, thinning, pruning, replanting or repotting to ensure energy remains healthy and vibrant.